Whether it’s autonomous delivery bots dropping off pizza, robo-bartenders, or automated waiters, it’s clear that robots have a growing place in the food industry. But a new Japanese pop-up cafe located in Tokyo offers a far more uncommon — and potentially transformative — spin on this premise. 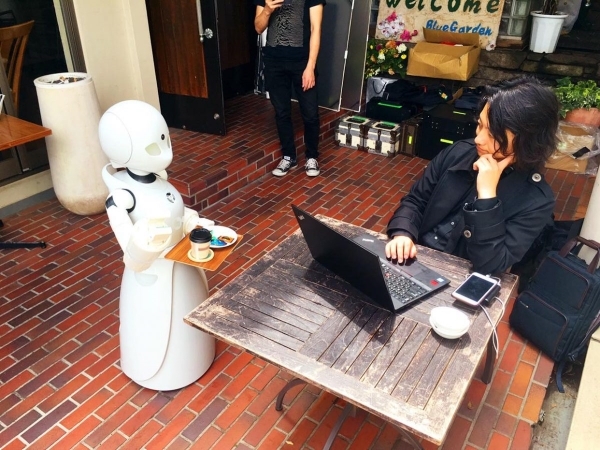 Called Dawn ver.β, the temporary eatery is staffed by robot waiters operated remotely by paralyzed individuals, who can control the robots from their own homes. The cafe is based on the 2008 anime Time of Eve, set in a future in which androids are commonplace. The four-foot-tall OriHime-D robots were built by Ory, a Japanese startup focused on developing robotics for people with disabilities. The robots can reportedly be made to move, look around, speak with customers, and carry objects, even when their operator is only able to control his or her eyes. The staff of 10 people, whose conditions range from spinal cord injuries to ALS, are paid 1,000 yen per hour. Equating to $8.80 in the U.S., this is the standard wage for part-time work in Japan. The goal of the project isn’t about getting cheap labor, however. It’s a pilot scheme intended to give independence to people who might otherwise not have the chance to be involved with anything like this. Their ability to interact directly with clientele at the cafe is touted as a big part of the project’s appeal. Unfortunately, Dawn is only a short-term trial right now. The cafe will close its doors at the end of the week, after a trial opening period lasting for around two weeks. The funding for this trial was partly raised through crowdfunding, along with support from several companies. Going forward, the hope is that a permanent Dawn cafe will open sometime in 2020. That obviously depends on the extent to which this demonstration has proved a success. In all, it’s certainly an interesting idea. So-called telepresence robots already provide a way for people who are, for whatever reason, excluded from a certain activity to take part. These robots, which frequently include features like two-way video, cameras, microphones, and speakers, have been used in schools to help chronically ill kids to attend class. They’ve even been used as part of graduation ceremonies. Could a permanent restaurant be the next frontier?